National Politics. 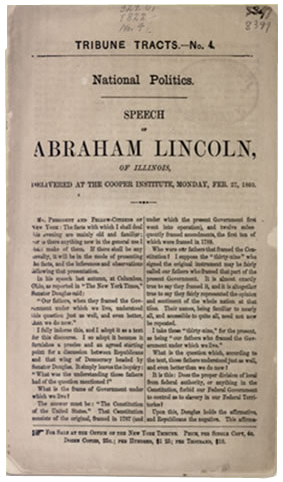 Speech of Abraham Lincoln, of Illinois, Delivered at the Cooper Institute, Monday, Feb. 27, 1860. [New York]: New York Tribune, . According to his biographers, Lincoln's "Cooper Union Speech" did more to secure his nomination for the presidency than any other act. The speech simply states that slavery is wrong and it is not possible to find common ground with those who say it is right. One of Lincoln's most quoted remarks appears at the end of this speech: "Let us have faith that right makes might, and in that faith, let us, to the end, dare to do our duty as we understand it."